Jet Airways is desperately looking for a buyer to raise funds for survival. 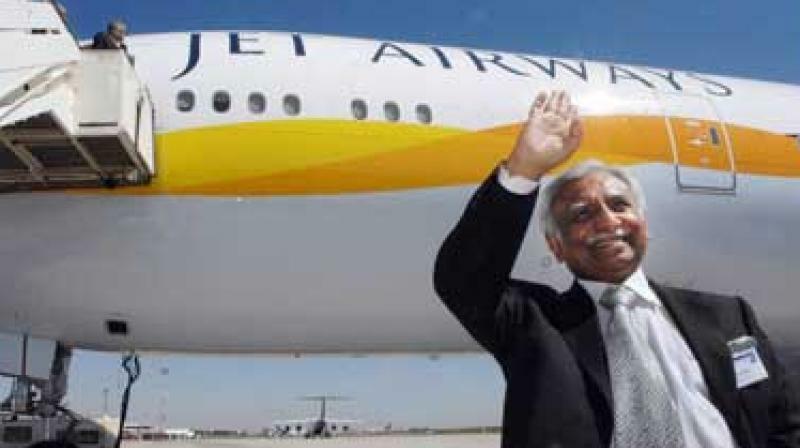 New Delhi: Finding it hard to save the airline in the face of severe cash crunch, promoter Naresh Goyal is ready to relinquish his controlling stake in Jet Airways to prospective investors. Industry sources said Goyal has held discussions with all three prospective buyers —Tata Group, Etihad Airways PJSC and a consortium of Air France-KLM and Delta Air Lines. “Goyal, however, wants to keep a minority stake in the company. He would also insist for a board seat with the investors,” an industry executive said. On reports of possible share sale by the aviation industry veteran, the airline stock surged 5.20 per cent to Rs 308.80 on the BSE on Wednesday. Goyal had founded Jet Airways almost 25 years back after the government liberalised the policy and allowed entry of private air taxi operators. The airline has since grown steadily and become a key player in both domestic and international markets. Abu Dhabi-based Etihad currently holds 24 per cent stake in the Mumbai-based carrier. “There is also possibility of Etihad raising its stake further to 49 per cent, the highest permissible limit for any foreign carrier,” the executive quoted above said. According to sources, Goyal has roped in industry veteran Capt Hameed Ali to lead talks with shareholder Etihad Airways. Capt Ali was instrumental in Jet Airways’ deal with Etihad in 2013, when the Abu Dhabi-based airline bought a 24 percent stake in its Indian peer. Saddled with a debt of about Rs 8,000 crore as of September 30, Jet Airways is desperately looking for a buyer to raise funds for survival. It has already held talks with Tata Group to sell part of its stake. The salt-to-software business conglomerate has confirmed its interest in acquiring the airline but has termed the discussions so far as preliminary. “Over the last few days there has been growing speculation about Tata's interest in Jet Airways. We would like to clarify that any such discussions (to acquire Jet Airways) have been preliminary and no proposal has been made,” Tata Sons had said in a statement a fortnight ago. With each passing day, financial health of Jet is worsening. The precarious financial position could lead to default on aircraft lease rental payments and airport charges. It has already sought breather from its creditors and a longer delay could land it in deep trouble. The airline has been delaying salaries of its staff besides handing out pink slips to dozens. A section of pilots has already protested against salary delays and wants commitment from management on timely payment of their salaries besides clearing the previous dues. Jet Airways has posted loss for the last three consecutive quarters on rising fuel prices and fierce competition in the local market.